Works by five artists celebrate the small objects that inhabit people's personal spaces. Some items may be subversively political while others may be secretly emotional touch points. Relating to classic European still life painting that told a story of class, economics, and stature by the objects selected in each tableau, these artists depict mundane everyday items that inherently discuss our contemporary lives, celebrate our existence. Originally part of the seventh Micro Film Festival #7, this special exhibit featuring interdisciplinary artist Taji Ra'oof Nahl projects three films simultaneously as the artist explores the past- and present-day surveillance state. The MCCC Visual Arts Faculty Exhibition features work by the college's Visual Arts (computer graphics, alternate media, painting, photography, print-making, sculpture, video) faculty members. 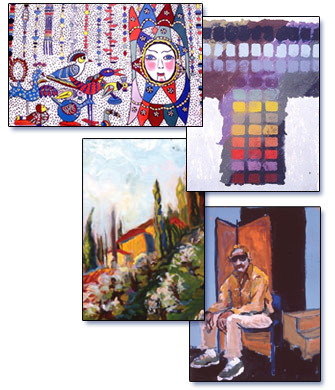 All exhibited work is current (produced in the last two years) and portrays the range of styles and formats present in MCCC's diverse faculty. Recent shows have included artworks in oil painting, watercolor, ceramics, photography, digital design, interactive technology, sculpture, installation, and more. Opening Reception: Wednesday, September 19 from 5 to 7:30 p.m.
Award Winners to be Announced at Opening Reception May 23. 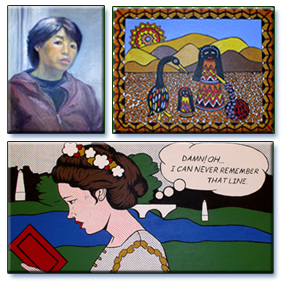 Opening Reception and Awards Ceremony: Wednesday, May 23 from 5 to 7:30 p.m. Opening Reception: Wednesday, April 4 from 5 to 7 p.m. Opening Reception: Wednesday, August 30 from 5 to 7 p.m. Opening Reception: Wednesday, April 12 from 5 to 7 p.m. 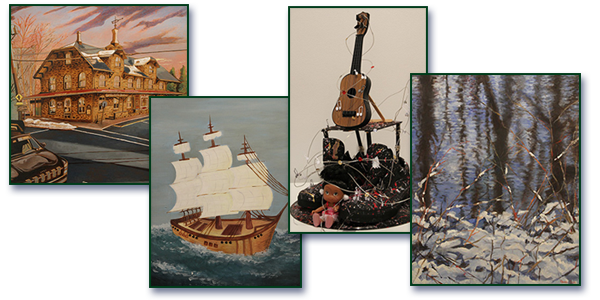 In partnership with the Mercer County Cultural & Heritage Commission, The Gallery will showcase the work of artists who live, work, or study in Mercer County, New Jersey. This popular exhibition is a juried show with multiple levels of awards, including the coveted County Purchase Awards. Other past awards have been sponsored by Blick Art Supplies and the West Windsor Art Council. Opening Reception/Awards: Wednesday, February 22 from 5 to 7:30 p.m.
Curated by Tiffany Calvert, featuring artists Hayley Barker, Matthew F. Fisher, Karla Knight, Chris Martin, Kristine Moran, Sarah Peters, Henry Samelson, and Laurel Sparks. All deal with some otherworldly concern -- transcendentalism, mysticism, or the manifestation of imaginary histories -- addressed by the artists as incancatory, paradoxical or futile. The varying works are modest in scale and take a variety of representational and abstract forms. Thursday, November 10 from 5 to 7 p.m. In 2016 Mercer County Community College celebrates its 50th year. The Gallery will offer a special exhibit as part of the college's year-long celebration. The exhibit will feature artworks from current and emeritus visual arts faculty as well as selected MCCC alumni representing each of the college's arts programs. Opening Reception: Wednesday, September 21 from 5 to 7 p.m. Opening Reception: Wednesday, April 13 from 5 to 7 p.m. 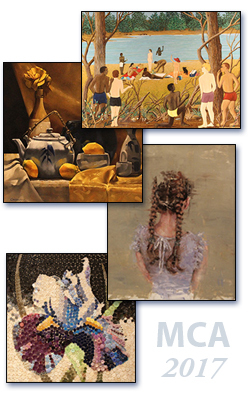 Opening Reception: Wednesday, February 22 from 5 to 7:30 p.m.
MCCC Gallery Calls for Entries for "Mercer County Artists 2016"
Opening Reception: Wednesday, November 18 from 5 to 7 p.m. 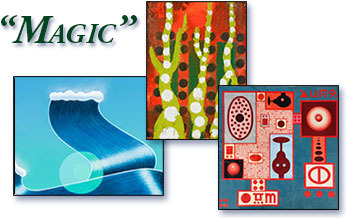 Opening Reception: Wednesday, October 14 from 5 to 7 p.m. Opening Reception: Wednesday, September 9 from 5:30 to 7 p.m. Opening Reception: Saturday, June 13 from 6 to 8 p.m. Opening Reception: Wednesday, April 22 from 5:30 to 7:30 p.m. Opening Reception: Wednesday, March 11 from 5:30 to 7:30 p.m. 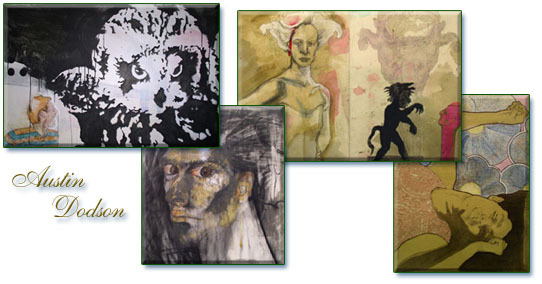 Opening Reception and Awards Ceremony: Wednesday, February 4 from 5 to 7:30 p.m. Opening Reception: Wednesday, October 8 from 5 to 7 p.m. 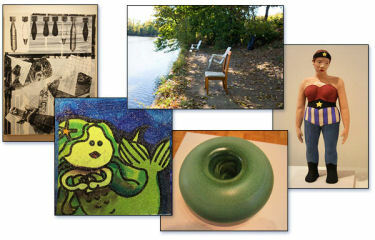 Opening Reception: Thursday, September 4 from 6 to 8 p.m.
prints, sculptures, ceramics and more fill the Gallery. Opening Reception: Wednesday, April 30 from 5 to 7:30 p.m. Opening Reception: Wednesday, Nov. 17 from 5 to 7:30 p.m.
Solstice Concert: Monday, December 20, 6:30 p.m.
on Holocaust Education and the Mercer County Holocaust/Genocide Resource Center. Opening Reception: Wednesday, Oct. 13, 4:30 p.m. Closing Reception: Wednesday, Sept. 29 from 5 to 7:30 p.m. Opening Reception: Thursday, April 29 from 5 to 7:30 p.m.
to activate and test new formal and conceptual connections between the works"
Opening Reception: Saturday, Dec. 5 from 2 to 4 p.m.
Gallery Talk: Tuesday, Dec. 1 at 11 a.m.
Concert: multi-instrumental improv duo Stop Correcting Me - Wednesday, Dec. 9 at 7:30 p.m.
include sound installations, interactive video stations, sculpture, photography, prints, and multi-media sculptures. Opening Reception: Saturday, Oct. 17 from 2 to 4 p.m.
Gallery Talk: Monday, Oct. 26 at 7 p.m.
Concert: multi-instrumental improv duo Stop Correcting Me - Thursday, Nov. 5 at 7:30 p.m.
all residents or students of Mercer County -- working in all photographic media/processes. 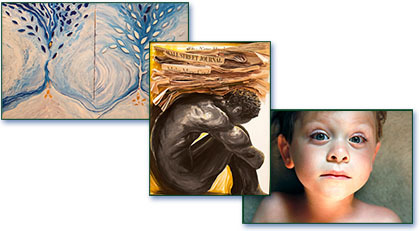 Opening Reception and Awards Ceremony: Sept. 16 from 5 to 7:30 p.m. Opening Reception: Wednesday, April 29 from 5 to 7:30 p.m. 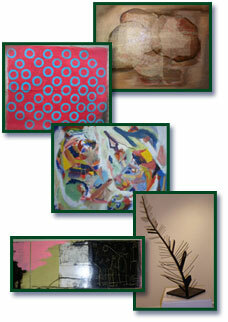 Opening Reception: March 18 from 5 to 7:30 p.m. 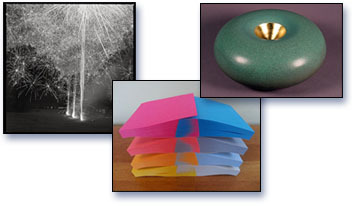 Opening Reception: Saturday, Jan. 24 from 2 to 4 p.m.
Gallery Talk/Presentation: Monday, Feb. 2 at 7 p.m. Opening Reception: Wednesday, Nov. 12 from 5 to 7:30 p.m.
Gallery Talk: Thursday, Dec. 4 at 6:30 p.m.
Winter Solstice Event: Wednesday, Dec. 17 at 6:30 p.m. Opening Reception: Wednesday, Sept. 17 from 5 to 7:30 p.m.
Gallery Talk: Monday, Oct. 13 at 7:30 p.m.
change, embellish, color, and re-create the objects and environments that define their lives." 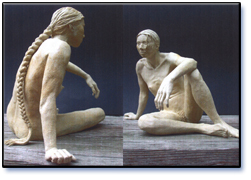 Opening Reception: Saturday, June 14 from 1 to 3:30 p.m.
drawings, prints, sculptures, ceramics and more fill the Gallery. Opening Reception: Wednesday, April 23 from 5 to 7:30 p.m.
faculty, selected by Thomas Roma, director of Columbia University's photography department. 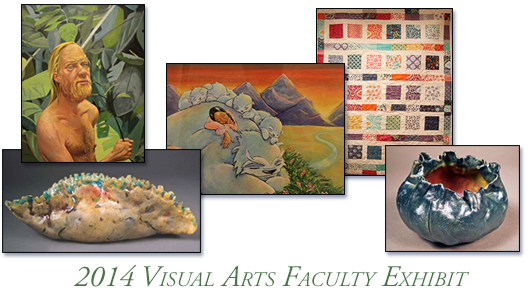 Opening Reception & Awards Ceremony: Wednesday, Nov. 28 from 5 to 7:30 p.m. 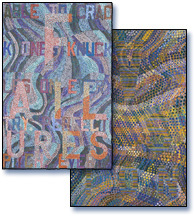 Chronicles the histories of 15 female Holocaust survivors in poster-size panels, as well as art created by child survivors -- a cooperative project between the New Jersey Commission on Holocaust Education, Kidsbridge Children's Museum in Trenton, NJ, and the Mercer County Holocaust/Genocide Resource Center. Open House: Saturday, Oct. 14 at 3 p.m.
Camp, tells her story and presents drawings and poetry. "adopted" artist chosen by each. 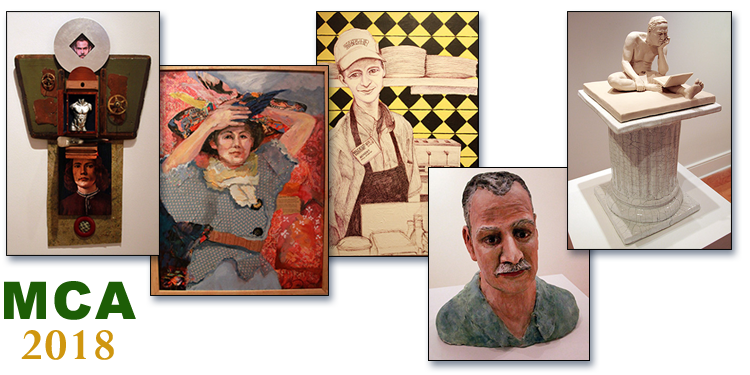 Featuring the work of 70 outstanding contemporary women artists from the tri-state area, each having selected one "Dangerous Woman" during her lifetime as her inspiration - an artist, activist, or visionary from the early 20th century (between the World Wars) connected to this geographic area. The historic subjects, researched by Gallery director and exhibit curator Tricia Fagan, represent a broad spectrum of women who took artistic and personal risks, challenging the roles of womanhood, art, and society. Invited artists have created a new piece of art as an homage to their selected artist's life, art, or philosophy. Works will be displayed beside a text panel featuring a short biography of the artist they "adopted," and Artist Statements exploring the relationships will be available in The Gallery for the duration of the exhibit. Opening Reception: Saturday, Sept. 8 from 2 to 5 p.m.
Gallery Talk: Wednesday, Sept. 19 at noon -- Gallery director and exhibit curator Tricia Fagan talks briefly about the historical context, followed by Dangerous Women Two artists Maggi Johnson (MCCC instructor), Cindy Stockton Moore, and Judy Tobie talking about their process and art in the show. 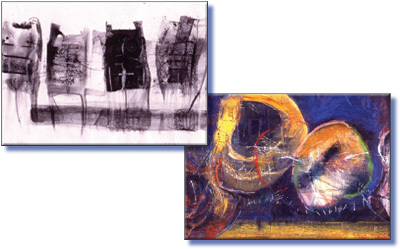 FROM LEFT: "Fay Wray" by Jane Lawrence is inspired by the actress' most famous role as King Kong's leading lady; jewelry designer Dori Seider created this piece in homage to Isadora Duncan, one of the mothers of modern dance; Margaret Sanger is the inspiration for this mixed media reverse painting by Deborah Hockstein; detail of Cindy Stockton Moore's encaustic inspired by the life of Gertrude Ederle, the first woman to swim the English Channel; Denise Dmochowski's "For Georgia" is inspired by the work of acclaimed painter Georgia O'Keefe; the paintings of African-American artist Laura Wheeler Waring inspired Livy Glaubitz's watercolor. Opening Reception: Wednesday, April 25 from 5 to 7:30 p.m.
Wednesday, March 14 from 5 to 7:30 p.m.
Wednesday, Nov. 29 from 5 to 7:30 p.m.
Monday, Dec. 4 at 7 p.m.
Gallery Talk: Monday, Oct. 30 at 7:00 p.m.
Wednesday, Sept. 20 from 5 to 7:30 p.m. Opening Reception: Wednesday, April 26 from 5 to 7:30 p.m. Opening Reception: Wednesday, March 8 from 5 to 7:30 p.m.
Wednesday, Jan. 25 from 5 to 8 p.m.
Wednesday, Feb. 8 at 7 p.m.
Wednesday, Nov. 16 from 5:30 to 8 p.m.
Saturday, Oct. 1 from 3 to 6 p.m.
Wednesday, Oct. 19 at 7 p.m.
Gallery Talk: Tuesday, Oct. 4 at 7 p.m.
Friday, Oct. 14 from 6 to 8 p.m. 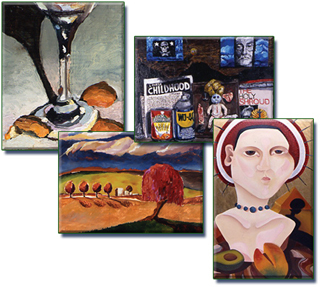 Opening Reception: April 20 from 5 to 7:30 p.m. Opening Reception: March 9 from 5 to 7:30 p.m.
Last year, distinguished MCCC Painting and Art History professor Mel Leipzig did a portrait of four of his art students -- Jon Allen, Clint Inting, Olivia Jupillat, and Sid Whitfield -- with their artwork behind them. Two graduated from MCCC last year, but Leipzig was so taken with their work that he suggested an exhibition of their current work. "These are extraordinarily talented and dedicated young artists," Leipzig said. 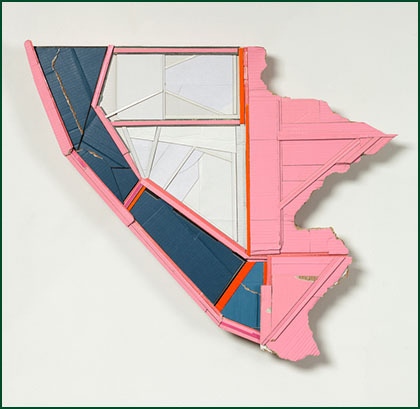 "Their work bodes well for the continuing vitality of painting in New Jersey." 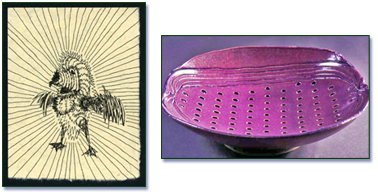 Opening Reception: Wednesday, Jan. 19 from 5 to 7:30 p.m.
Gallery Talk: Wed., Feb. 2 at 7 p.m. Featuring 81 artworks (in every sort of media!) 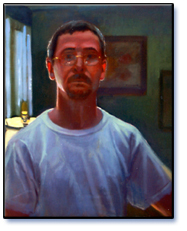 by 77 artists - all members of the Trenton Artist Workshop Association (TAWA). Opening Reception: Wednesday, Nov. 10 from 5 to 8 p.m. 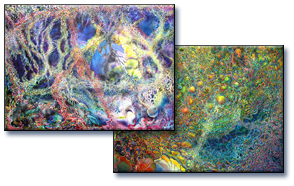 Featuring the artwork of Randall Greenbaum and David Kaufmann. 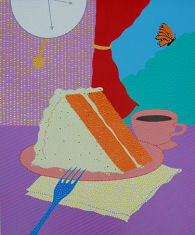 Opening Reception: Wednesday, Sept. 29 from 5 to 7:30 p.m.
Gallery Talk: Wednesday, Oct. 6 at 7 p.m. 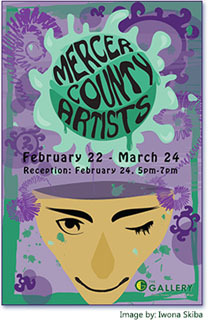 Featuring works in all media by the Fine Arts students of Mercer County Community College. Opening Reception: Wednesday, April 28 from 5 to 7:30 p.m. Annual juried competition of works in most fine arts media created by artists living, working, or studying in Mercer County. This is a collaborative initiative sponsored by the Mercer County's Cultural and Heritage Commission, supported by the NJ State Arts Council. Opening Reception: Wednesday, March 10 from 5 to 7:30 p.m.
A group exhibition by Mercer County Community College's Fine Arts faculty members. Opening Reception: Wednesday, Jan. 28 from 5 to 7:30 p.m.
An exhibition of works by at least nine outstanding contemporary African-American visual artists, curated by Larry Hilton. Opening Reception: Saturday, Dec. 13 from 2 to 4 p.m.
"The Allegory of Immortal Immolation as Portrayed Through a Spectacular Procession of Epic Proportions"
A multi-media installation by MCCC fine arts faculty members Edgar Endress and Mark Stockton. Opening Reception: Wednesday, Oct. 29 from 5 to 7:30 p.m.
Exhibition introduces the works of five young, emerging artists: Dan Hodgkinson, Jason Houck, Eric Kennedy (website), Matt Lucash, and Kathryn Sclavi. 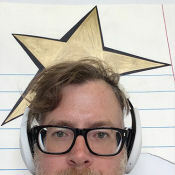 In an effort to further the artistic conversation of the exhibit, the artwork on display will be accompanied by essays by art professors/art critics familiar with the exhibited works (Greg Drasler, Mel Leipzig, Frank Rivera, Kyle Stevensen, and Kate Somers.) Each essay discusses a dialogue which the author believes is happening between the work of one of the young artists and that of any other artist, contemporary or deceased. 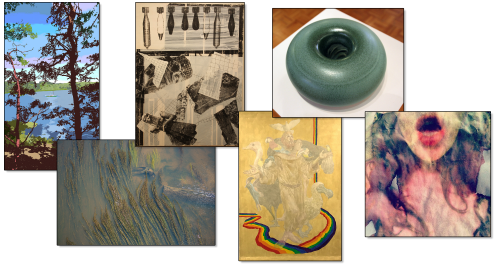 Artists' Reception: Wednesday, Sept. 10 from 5 to 7:30 p.m.
Panel Gallery Talk: Wednesday, Sept. 17 at 7 p.m.
TUE: 11 a.m. to 3 p.m.
THUR: 11 a.m. to 3 p.m.